You approach a wide, squat tower. Crossbowmen peek out from behind its crenelations. A purple banner flies over the tower, snapping loudly in the wind. A deep, wide ditch surrounds the tower, and the only way across is a narrow stone bridge. At its far end stands a small gatehouse where two men, liveried in purple, are on watch. What are you going to do? So Little Time To Collect All The Treasure! 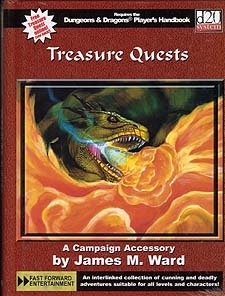 Treasure Quests presents a tremendous variety of linked adventures for d20 System play. All set in a fantasy universe, each encounter has a complete map and game details, including extensive game statistics, presented in an easy-to-use lay-flat format. Open the book and it stays open right where you want it. Each thrilling adventure can easily occupy an entire evening of role-playing action, but taken together Treasure Quests becomes an entire campaign. The better part of a character's adventuring life can be spent defeating the enemies and gathering the treasures herein, and any who survive these depths of danger will be hailed throughout the lands. * A huge series of adventures beginning with low-level enounters in a country village and ultimately ending in awesomely powerful challenges for high level characters. * The lay-flat, ring binding is perfect for the game master's use. Open it to any two-page spread, every one designed for a night of exciting adventure. * Well-guarded treasures fill this book, but the real adventure is trying to collect all the hidden treasures of ancient heroes. Centuries ago a band of three brave heroes cleansed the land of evil. Their legacy, in the form of ancient magical items, is waiting out there for new heroes to find.